The best man's words, the maid of honor's memories, the father of the bride's advice, - all of the speeches at a wedding reception create so much emotion for the couple. At this four-day Cabo wedding, the couple had over 200 guests and many people speaking at the reception on the dance floor as well as toasting from their seats. Lighting and decor that was elegant, romantic, and luxurious was the goal of planner LK Events and designer & florist Elena Damy. But it also had to be practical so guests could socialize together and see the speeches and other reception events planned for the night. Hanging florals combined with low profile centerpieces allowed guests to see each other and interact across the tables. 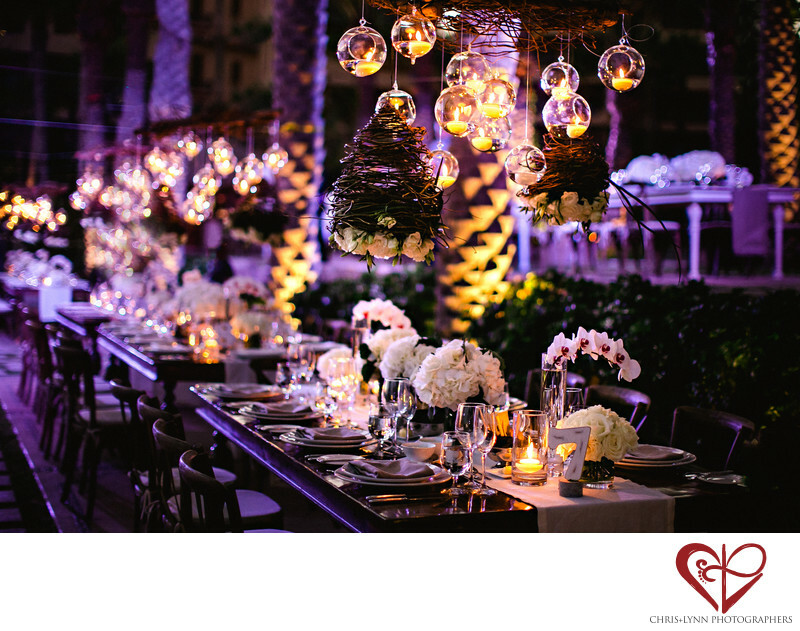 A combination of accent lighting with warm spotlights and lots and lots of candlelight created a romantic ambiance. A purple color wash combined with soft & neutral white lights means flattering skin tones in photos (avoid at all costs any orange overall or spotlit lighting unless you are going for a Kenny Rogers Roasters look!). Having a professional lighting plan is one important factor that really contributes to creating the mood to the reception. It also allows us as your photographers to be even more discreet while capturing images as we can photograph without using distracting flash or setting up additional lights. As The Knot says, "When done well, lighting can make everything look better, from your wedding cake to your guests!" The right kind of illumination will also get those details you spent hours on noticed... lighting is the jewelry of a space—just as a certain mix of baubles can make an outfit, the right lights will make your reception unforgettable." Location: Carretera Transpeninsular Km. 7 Mz 10, Punta Ballena, 23410 Cabo San Lucas, B.C.S., Mexico. 1/500; f/1.2; ISO 1600; 50.0 mm.